Get the drop on rain in our rugged Medford coat. Constructed of tough 100% polyester knit fabric with a PU (polyurethane) coating, it’s stretchable for easier movement throughout your workday. 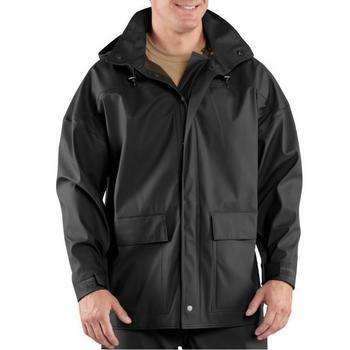 Waterproof and strong, the jacket’s seals are heat sealed, and the major seams are also sewn for added strength. 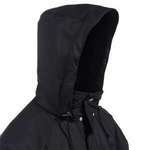 Pull up the attached hood when weather threatens, then roll it into the collar when it’s not needed. 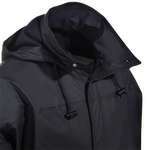 For added protection, it features double storm plackets with snap closure. Storage is provided by two large lower-front pockets with hook-and-loop closures, one of which features a convenient media port to the inner garment allowing you to string headphone wires.